This is a new printing on sturdy acid-free paper. His Opus 69 was first published in 1890 in an issue of Ashmall’s The Organists’ Journal. 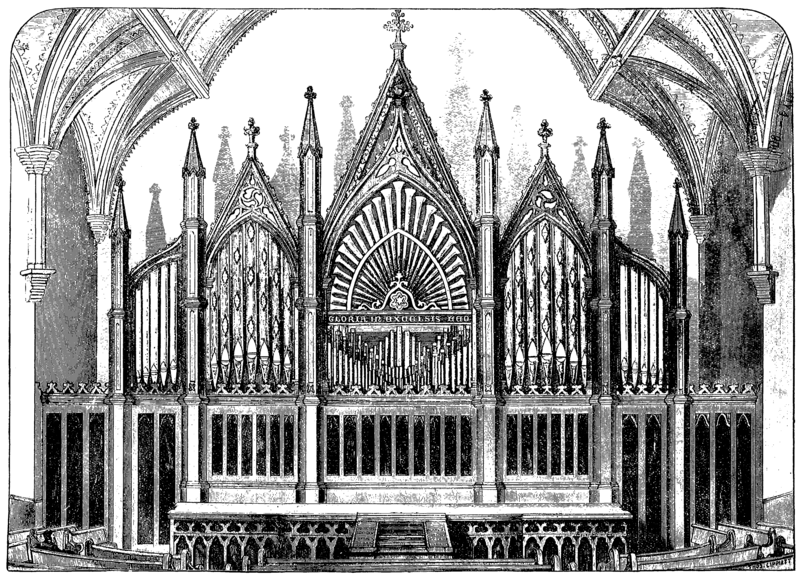 We include a capsule biography and an article, “The Pipe Organ” by Richard W Crowe. 8 pages. Highest quality guaranteed. Size of music is 13.5" x 10.5". $8.00. Henry Eyre Browne (1848-1925) was born in New York City and studied organ locally and sang as boy soprano in the choir of Trinity Church, Wall Street. For those who know that the Brooklyn (Dr Talmage’s) Tabernacle burned in October 1889 where their III/44 Jardine (1873), shown to right, burned, Browne “lost his entire collection of organ music, and all his very valuable transcriptions, numbering in all 4,215 pieces.” He was a founder of the American Guild of Organists. Meditation was dedicated to the great American organist and immediate predecessor at the Brooklyn Tabernacle, George W Morgan. It would make a good offertory or communion piece. Moderately easy.